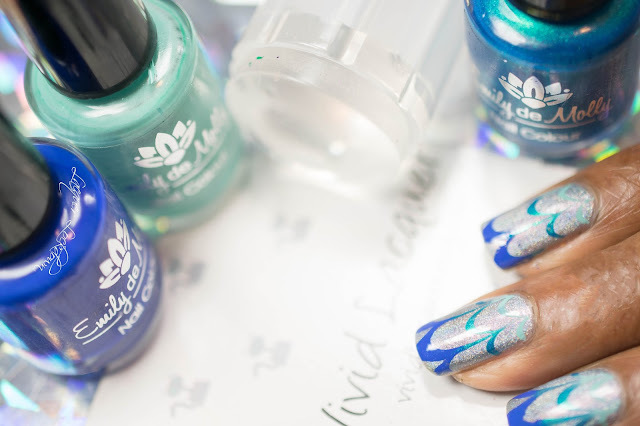 For all those howling in the rabble for my witchy watermarbling blood, see SimplyNailogical, I bring you a nice alternative using my new stamping polishes from Emily de Molly ;) You can check out my in depth review of them here. Now if you can't watermarble you can fake it till you make it using this cascade watermarble plate from Vivid Lacquer. 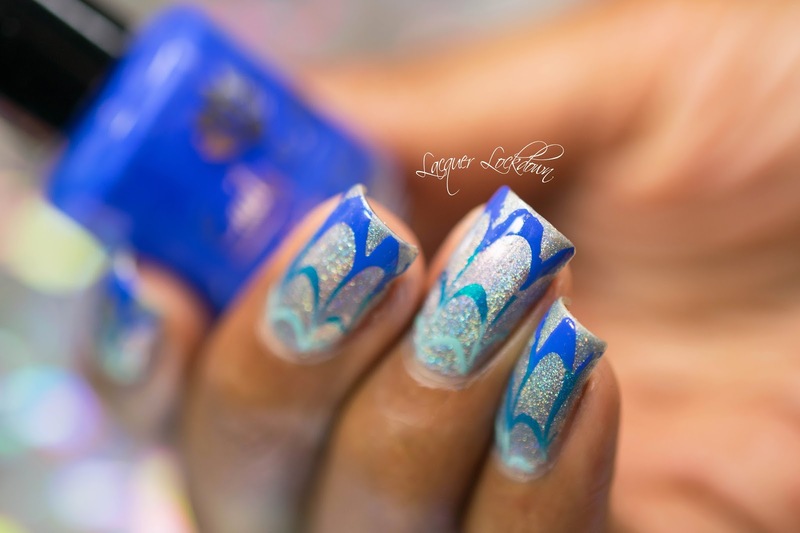 Btw watermarble plates have been around for a while now, VL's was one of the first, but now it seems they are gaining popularity. So as long as you can stamp you can also get a similar effect ;) Rejoice! More often these days people are asking me about everything I'm using so I'm going to start putting the stamper I use in the details as well. For the ones that are no longer available they will be annotated as such. Anyhoo isn't this super pretty? 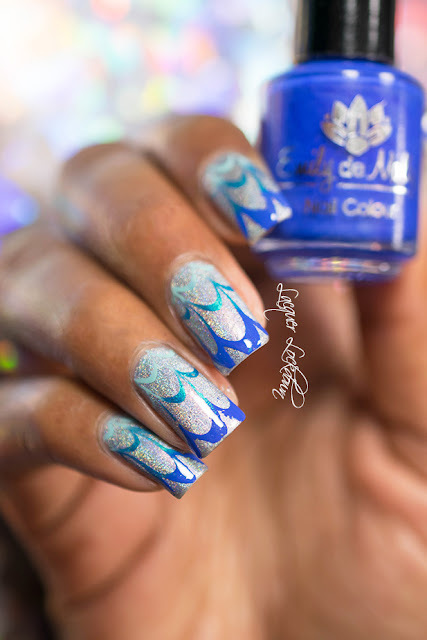 I made this especially with my EdM stamping polishes in mind. They are very opaque as you can see and though I don't think it was intentional the color family sent to me marries together really well here. 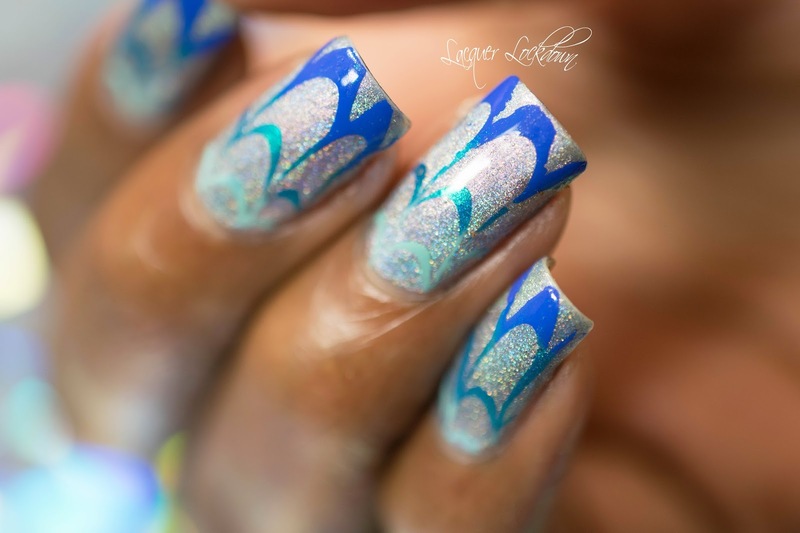 That metallic teal <3! Ugh just creating such an awesome contrast to the silver holo I love it so much! Lots of awesome lining up in this photo - EdM stamping polishes, Vivid Lacquer stamping plate, and Messy Mansion Crystal stamper! About these EdM polishes. I have to say I'm so impressed! The opacity and loveliness of the metallic teal in particular blew me away. I have to say Hayley did a fantastic job with these polishes. I think that this is the case because she is also a stamper. It's easy to get frustrated when you are stamping if the polish doesn't behave properly. If you want to read more about these polishes and see up close swatches you can read my review here. Ok so what do you think? I love how this flashed around at every angle I held my hand. I would just occasionally stop and stare. Lol. 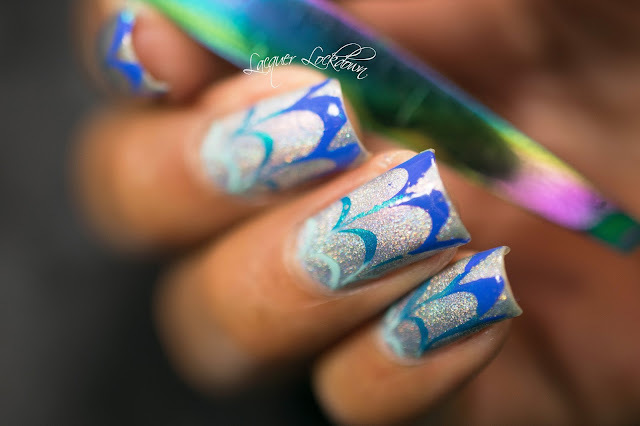 Its truly a sad case how addicted to holo and stamping I am! I just can't stop and the products just keep getting better and better! Gah. Thanks for reading and I'll see you next post! This post contains items that were sent to me as press samples and items I purchased myself. For more information see my Disclosures Policy.